I made this for my Big Sweetie today and thought I would share the recipe. 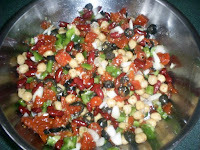 Mix all together and let stand refrigerated for 3 hours. Posted by Lisa at 6:02 p.m.
Yummy, that looks so tastey. Thanks for sharing. I used to make one that sounds very similar, but I lost the recipe. I can't wait to try it. March 13, 2007 at 9:03 p.m.